Meridian Redi-Ride Service: An advance reservation, curb-to-curb service within the township's service area. Monday morning rides needed before 10:30 a.m. must be scheduled no later than 5:00 pm on Saturday. Rides needed Tuesday through Friday before 10:30 am or before noon on Saturday must be reserved before 5:00 pm the day before. Monday trips scheduled before 10:30 am must be cancelled by 5:00 pm Saturday. Trips scheduled for the day after a holiday before 10:30 am must be cancelled by 5:00 pm the day prior to the holiday. Download Meridian Redi-Ride audio schedule (3.2 MB MP3). Looking for audio schedules for other routes? Access all audio schedules on our Disability Services page. We have plenty of reasons why you'll want to visit our community and enjoy our prime parks, trails and events. Knowing which events are happening in Meridian Township can help you plan your destination route! Use our Pedestrian Pathway Map or Trail Maps to go motor vehicle free throughout the township. 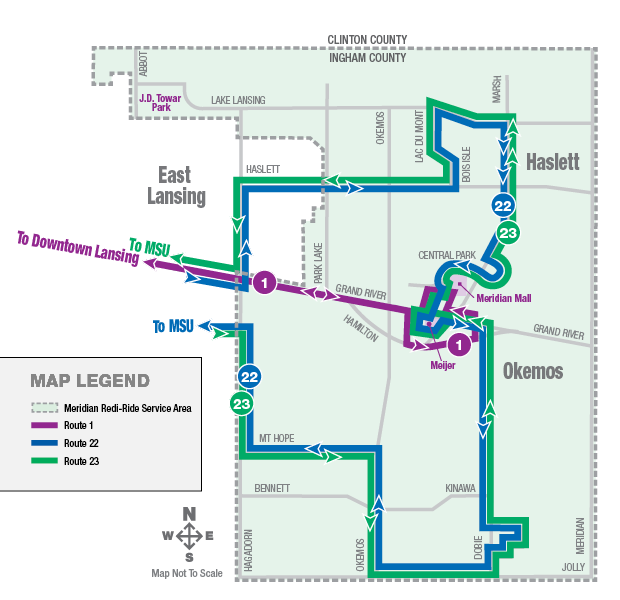 The Michigan Flyer has connections between East Lansing, Ann Arbor, and Detroit Metropolitan Airport. They offer 12 – 13 round trips a day, depending on the boarding point. They provide comfortable coaches, free water and free WiFi. If taking the Michigan Flyer from the Detroit and Ann Arbor location to East Lansing; passengers will be dropped off at the Marriott East Lansing hotel. From there, take an uber, taxi or CATA to Meridian Township. We are just steps away!